The record books will show that the bespectacled 41-year old started the third and final round four shots behind wire-to-wire winner Kiradech Aphibarnrat and finished four behind him in joint sixth after a closing 70 as Peter Lawrie shot an eventful 71 to slip to 11th. In reality, Harrington will look back on this one as a title that got away. Out in five under 31, just a shot off the lead, he came home in an unhappy 39 with three successive bogeys from the 12th ultimately torpedoing his title bid. Whether it was the pressure of contending or a physical collapse given the suffocating heat and humidity of playing his ninth event in 11 weeks is anyone’s guess. Both were likely factors for Harrington, who only went to Thailand and Malaysia to boost his confidence with a victory or, at the very least, a victory challenge. With a week off now before he heads to the much-maligned TPC San Antonio for the Valero Texas Open to put the finishing touches to his Masters preparations, Harrington looks anything but a solid, dependable player under pressure heading to Augusta. His putting remains a question mark with a three-putt from inside 15 feet at the 13th, where he missed a return putt of less than three feet, summing up another weather-delayed day. While his competitive drive appears to be as strong as ever, there is to be no real power under the bonnet when he is required to put his foot down in the home straight. Taking 33 putts in the final round and 11 more than the winner over 54 holes was certainly a major factor. The Dubliner made two early birdies to get to within two strokes of Aphibarnrat on nine under par before play was suspended on Saturday. Title winner Kiradech Aphibarnrat celebrates his win in the Maybank Malaysian Open. Photo Jenny Matthews/www.golffile.ieHe returned to the course for Sunday’s finale with 14 holes to play and started sensationally, draining a 35 footer for eagle on the fifth and an 18 footer for birdie at the sixth to lead briefly on 12 under par. The rest was a series of disappointments. Aphibarnrat birdied the third to draw level, then eagled the par-five fifth to lead by two shots from the Dubliner on 14 under par and set up a fascinating finale. With Charl Schwartzel struggling, eventually carding a 71 to finish tied fourth with the French talent Victory Dubuisson on 11 under, the vastly experienced Harrington looked like the man most likely to challenge the burly, 23-year old Thai. Wearing a heart-monitor under his sweat-soaked white shirt, his title chances were soon on life-support, his spirit apparently broken. Playing with Dubuisson and the 41-year old Malaysian veteran S Murthy in the third last group, the three-time major winner left a birdie chance short on the par-three eighth. Aphibarnrat nervously three-putted the seventh to see his lead over Harrington reduced to one but he was never troubled by the Dubliner for the rest of the day. Murthy lost a ball up a palm tree at the 10th and while his caddie scaled it barefoot, the ball was not found. The Malaysian racked up a quadruple bogey nine there, leading to a delay that saw Harrington’s group forced to call through the penultimate threeball of Gregory Bourdy, Wade Orsmby and Tommy Fleetwood. Padraig Harrington studies his par putt at the 12th. Picture Jenny Matthews/www.golffile.ieFollowing a wait of close to 20 minutes in the fairway, Harrington failed to make birdie following an indifferent pitch and a 15 foot putt that caught a piece of the hole but was always missing low. But when he followed a par at the 11th with a hat-trick of bogeys from the 12th, his title hopes had gone. Playing just in front of Aphibarnrat could have put the Thai under even more pressure but Harrington went into reverse gear when a run of pars was required over the toughest stretch on the course. Short in the bank at the tough 12th, he called for a referee but ended up being forced to hack his third onto the green, where he missed the 10 footer for par. At the 13th he hit a superb approach from the left rough inside 15 feet but three-putted to fall three strokes behind and never recovered. With Anders Hansen in the clubhouse on 11 under, Aphibarnrat was more concerned with Italy’s Edoardo Molinari, who eventually carded a 67 to post the target at 12 under. One clear with four holes to play following a birdie at the 14th, the burly Thai had just hit his tee shot at the 16th when play was suspended for two hours because of a lightning storm. According to the Asian Tour, he came back out shaking at the prospects of winning the biggest title of his career but birdied the 16th hole from four feet to open up a two-shot advantage. 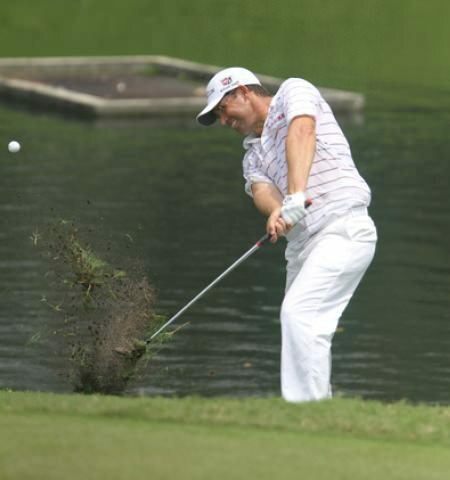 He then enjoyed a stroke of fortune when his approach into the 17th green ended just a few feet from the water hazard. After leaving his chip some 15 feet short of the flag, Kiradech drained his par putt and celebrated with a clenched fist. Playing it safe with an iron off the tee on the last, a closing bogey did not matter as his three-day total of 13-under-par 203 was one clear of Molinari. “After I made birdie on 16, I knew I had a chance to win,” said the champion, who has been suffering from fatigue due to a thyroid disease. Like Harrington, Peter Lawrie also had to call for a ruling at the 12th. Photo Jenny Matthews/www.golffile.ieMolinari, who was getting ready to warm up for a possible play-off, was disappointed he only made par at the closing 18th hole after a wayward drive. “I felt if I birdied the last I might have won outright because it puts a lot of pressure on the guy coming up behind,” said the Italian. Schwartzel, playing in the last group with Kiradech, rued the missed opportunity to emulate countryman Louis Oosthuizen, who won the Maybank Malaysian Open last season. “It was disappointing. It’s a hard week with being on and off the course the whole time. It’s difficult to find any rhythm. I feel like I swung the club pretty well, but I didn’t play that well today,” said the South African, who was searching for his second title in Asia after winning the Thailand Golf Championship last December. As for Lawrie, the Dubliner resumed his third round three off the pace, but birdied the eighth and then holed a huge birdie putt across the ninth green to to get to within 4 of lead on 10 under. However, after missing a 15-foot chance on the 11th, his title hopes disappeared with back to back bogeys at the 12th (where he had to chip in for his five after plugging his approach and firing his third through the green) and the 13th, where he horseshoed out from four feet. He would birdie the 200 yard 15th before finishing with a bogey six, eventually picking up prize money for €33,570 to move up to 63rd in the Race to Dubai. Harrington earned €55,673 to jump to 21st in the money list with earnings of €269,955 from his five European starts so far this year while tournament winner Aphibarnrat is eighth following a maiden European Tour win worth €350,411. Padraig Harrington tees off on the 15th in the first round of the Iskandar Johor Open. 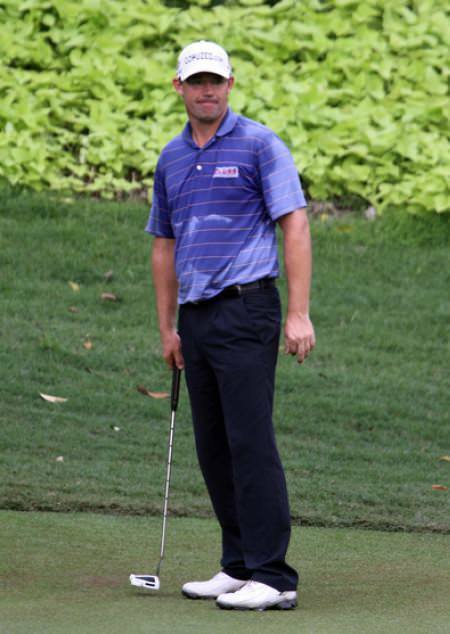 Photo Eoin Clarke/www.golffile.ieEven multiple major champions need a shot of confidence from time to time and Padraig Harrington is no exception.